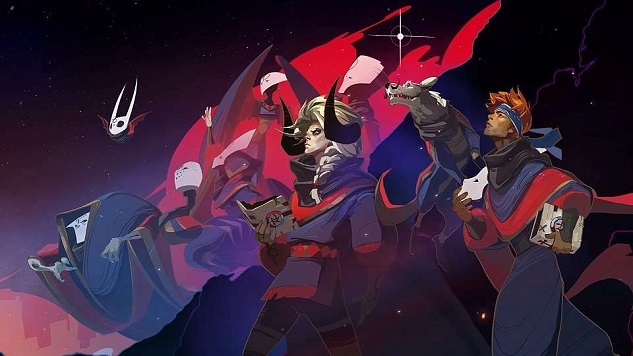 Pyre, the latest game from Supergiant (developers of Bastion and Transistor) is a lovely game about guiding a magical traveling cart across a prison fantasy land, while occasionally playing bouts of NBA Jam to convince the gods you’re cool enough to go free. And, because it’s Supergiant, all of this is way less weird in context. Some of the game’s strongest moments lie in its cast and their interactions. Throughout your travels, the player is introduced to a number of characters that together form the menagerie of faces within the caravan. It’s an odd assortment: ex-cons, warriors, spurned family members, bog witches; all of them coming together for no real reason other than because together they have the best shot of getting out of the Downside. Games often trade in “found families” the groupings we find in places where we can’t find much else, the trustworthy few. In another game defined by its character families, Mass Effect, the crew members of the Normandy are called to action to fight a higher power. The Reaper threat is an existential one, and one that will conceivably require the combined might of the galaxy to stop. There is little of this “chosen one” style melodrama in Pyre, and somehow that makes it feel more… honest. More down-to-earth, at least. These people aren’t revolutionaries—not yet. They’re just in a bad place, coping the only way they know how: by getting good enough at the Rites to win their old lives back. Each cycle of Pyre involves a gauntlet of Rites, matchups against the different teams of the Downside, followed by a final confrontation to send one of the winning team’s members back to the Commonwealth, the land of plenty where everyone used to live. These matchups highlight the core conflict of the game: we play together, but only one of us is going to get out of here in the end. The cruelty is intentional. As the game goes on, it’s clear the Commonwealth aren’t the good guys here. The hyperindividualist nature of the Rites’ ending ceremony (with a single player exalted to freedom) goes against everything you’ve been taught. Each player granted freedom is effectively dead to the player’s crew. Characters remark on their passing, and only the most optimistic believe they’ll ever see their old teammate again. After all, this the Downside. No one gets out of here. Pyre works because of this. It’s a masochistic design, but one that reflects the realities of group struggle. Bonds formed can fall off at the end of things, old friends drift away. No matter how much you accomplish, it’s under the shadow of the Commonwealth. When the time comes to overthrow those who put you in the Downside, it’s clear why it must happen. The only question is what’s going to happen to the bonds you’ve made down here.